CALGARY, Alberta (AP) The Calgary Flames have acquired defenseman Michael Stone from the Arizona Coyotes for two draft picks. Stone has a goal and eight assists in 45 games with the Coyotes this season and will be counted on to help shore up Calgary’s defense as it makes a playoff push. The Flames entered Monday’s games a point up on Winnipeg for the second Western Conference wild-card spot. 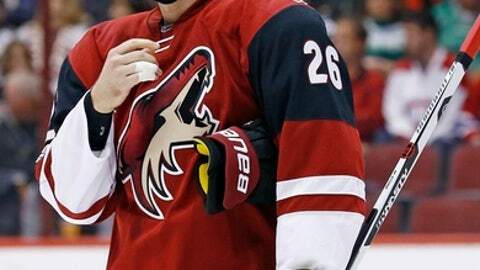 The 26-year-old Winnipeg native has 24 goals and 96 assists in 324 games with Arizona. The Coyotes, second to last in the league at 47 points, get Calgary’s third-round pick in the 2017 draft and a conditional fifth-round draft choice in 2018.